In this episode of CauseTalk Radio, Megan and I talk with Phil "The Godfather of Cause Marketing" McCarty about the signature cause marketing program he helped create, St. Jude's Thanks and Giving. Phil also offers some great advice and insights for nonprofits that want to realize their own Thanks and Giving aspirations. Cause Marketing with QR Codes. Did Chili's and St. Jude Miss the Mark? This is a guest post from Bob Jones of Give.mobi. For an overview of their service check out my post There She Blows! Cause Marketing, Mobile Gifts Surface with Give.mobi. You've probably heard about the successful partnership between Chili’s Grill & Bar and St. Jude Children's Research Hospital. This longstanding cause marketing pact has raised tens of millions of dollars with its Create-A-Pepper to Fight Childhood Cancer campaign. This year alone the campaign raised $5 million. A new feature of this year's campaign was a QR code on coloring sheets and table tents that took smartphone toting patrons to an information and donation page. Including a QR code on a major campaign such as this one is impressive enough, but here's the real news: patrons scanned the QR code a whopping 291,000 times! Critics of QR codes take note: consumers know what QR codes are and how to access their online content. 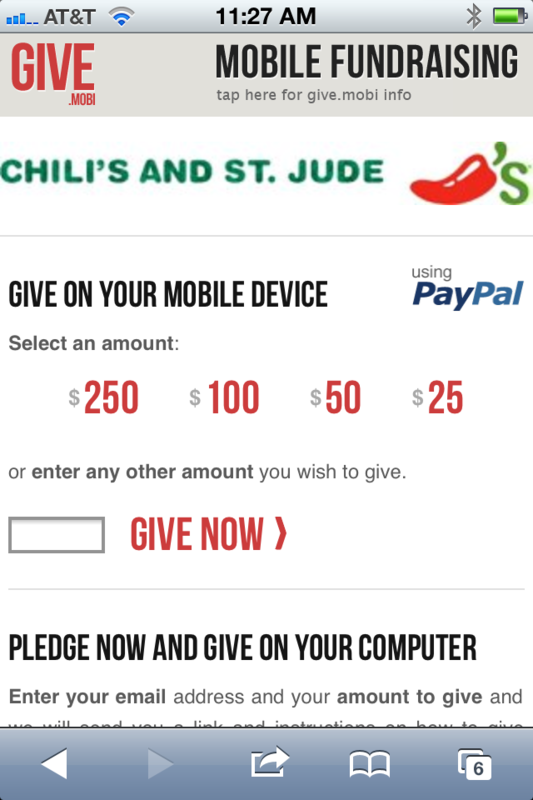 “By incorporating the QR codes into this charitable campaign, it was a great way to relate to Chili’s tech-savvy guests while giving St. Jude supporters another, easily accessible way to donate to the charity,” said Chili’s spokeswoman Julie Flowers. While I admire the partnership and the creativity of including a QR code, Chili's and St. Jude missed the mark on maximizing donations. When scanned, the QR code took the user to this page. Click on "3 Donate Online to Make a Difference" and you go to this page. The missed opportunity is obvious. This is where the user hits a wall. Would you want fill in all these boxes on your phone? The giving opportunity is DOA. 291,000 scans, but I bet you could count the number of donations made on this page with your hands and toes. There's a better solution: Give.Mobi. The donor can easily make a gift with PayPal, credit or debit card or a simple pledge option. In each case, you can make a donation in seconds because Give.mobi delivers a mobile experience that closes the gift. You also get real-time tracking of every donation by location so you can keep tabs on which restaurants are leading the pack, or lagging. QR codes for cause marketing are a great idea. But without a mobile-ready donation page to make giving easy, potential donors will navigate their giving elsewhere.